A new study concludes Facebook and other social media sites are playing a significant role in divorce rates and marital satisfaction. But is Facebook causing divorce or divorce causing people to use Facebook? WASHINGTON — Is Facebook breaking up marriages? A new study is the latest in a growing collection of research that suggests that heavy use of Facebook and other social media sites plays a significant role in marital dissatisfaction and divorce. What’s not clear, however, is whether Facebook is to blame. “We don’t know whether Facebook is causing divorce or divorce is causing the use of Facebook,” says Sebastian Valenzuela, co-author of the study and assistant professor in the School of Communications at the Pontifical Catholic University of Chile. Fottrell says previous studies support the conclusion of a link between social networks and marital problems. “In a 2011 University of Texas at Austin survey, 32 percent of heavy social media users have thought seriously about leaving their spouses, versus 16 percent of people who don’t use social networks,” says Fottrell. Fottrell says the social media giant doesn’t buy the connection. “Facebook says it’s ludicrous to suggest a link between the social network site and divorce,” says Fottrell. 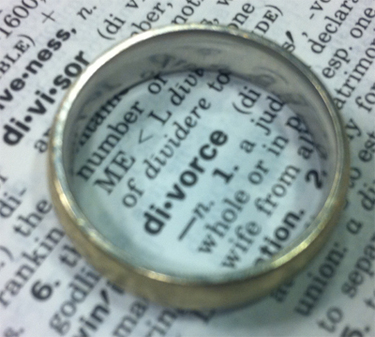 One-third of divorce filings in the United Kingdom contain the word “Facebook,” according to a 2011 survey by Divorce Online. As for why growing use of social networks appears to coincide with growing problems in marriage, Fottrell says researchers aren’t sure. “One theory might be [that] extramarital affairs might have taken months or years to develop in the past, but with Facebook, Snapchat, and all these other social networks, your ex-boyfriend or childhood sweetheart is just a click away,” says Fottrell. “Marriages obviously go through rocky patches and people seek support, but also, there’s temptation at your fingertips,” says Fottrell.